When Tlalane Letlhaku went along to the gala opening of H & M at Cape Town’s Waterfront, she wanted to know why there were no black models in the store windows. “Please work on that to appeal to everyone”, she wrote. To which H and M replied, in the self-immolation-by-tweet that is now common in the virtual world, “H&M’s marketing has a major impact and it is essential for us to convey a positive image”. Is it far-fetched to see H & M as the linear successor to Cecil John Rhodes, surveying their commercial hinterland with the assurance of superiority? Indeed, H &M’s window displays are very white. Despite their quick apology – “in no way does H&M state that positivity is linked to an ethnic group” – no overnight makeovers here. H & M is sticking to its guns: “H & M is proudly a global brand that embraces all people who are inspired by fashion, regardless of ethnic background, gender or culture”. In this shop window, whiteness rules. The problem, however, with casting H & M as the exception is that they are not. Some brisk fieldwork in the broad and opulent walkways of the Waterfront Mall – named for Queen Victoria and her son Alfred – reveals a plethora of whiteness. Zara’s Web page “offers South Africa a uniquely southern hemisphere collection which is constantly updated by delivering new merchandise to stores twice weekly”; it’s windows radiate whiteness. Online, Levi’s is a model of political virtue; “following the peaceful democratic elections in 1994, Levi Strauss & Co. was one of the first global companies to re-enter the South African market. Committed to empowerment and upliftment, 80% of its first staff intake were previously unemployed or had no prior industry experience”. And all Levi’s models in its Waterfront store – and on its South African web page – are white. Across the way from Levi’s, Fellowes Africa offers a “carved wooden colonial butler”, nestled in with bright fabrics and carved buffalo. Here, at “South Africa’s best African interior shop”, there is at last consistency without pretence; black bodies, the bush and subservience, uncomplicated by irony. Others, though, are a few steps ahead. 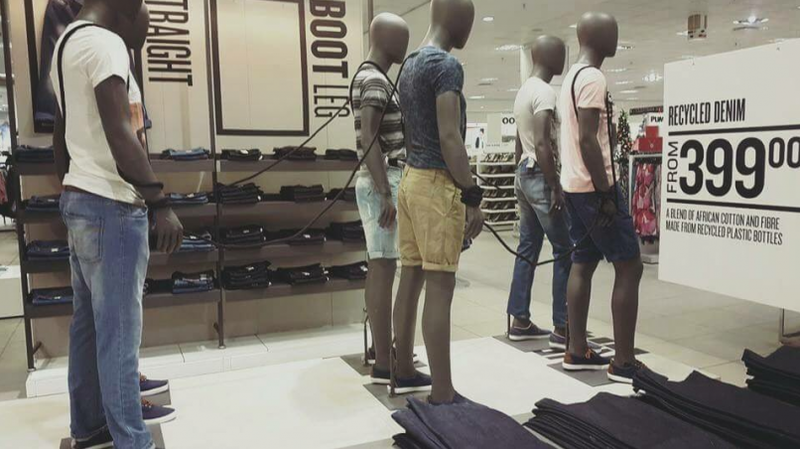 Mr Price has a good smattering of black bodies, although the pernickety shopper might notice that their features are distinctly Caucasian; are these white mannequins that have been spray-painted? Mr P does a lot better on its Web page – “we believe that fashion is for everyone” – so there could be supply problem here. Our mannequins are available in full body with heads, full body without heads, ¾ figure forms, torso’s (with or without stands) and underwear models, in both male and female variants. 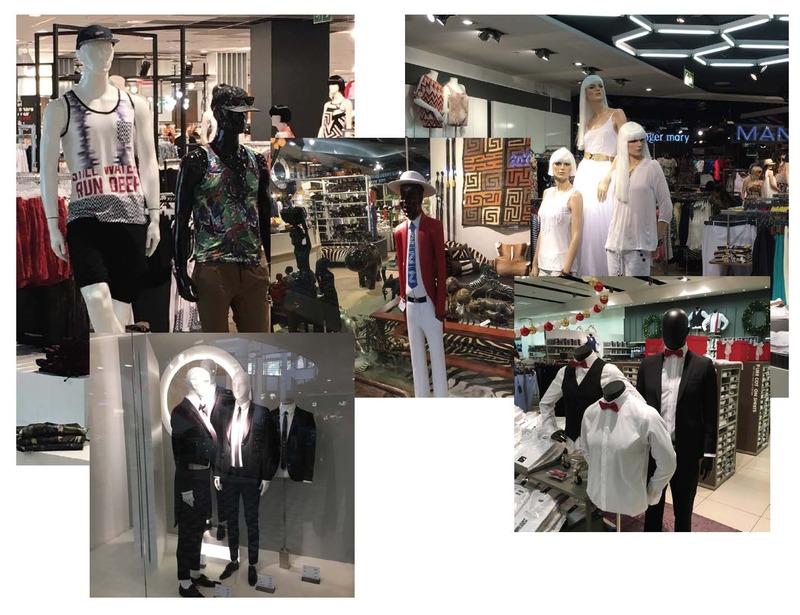 Our skilled technicians have all the knowledge and capabilities to enable us to repair and maintain mannequins competently as well as to repaint our current mannequins to the colours that our customers may desire. If I wanted a black mannequin, then, it has to be either a colonial butler or something spray painted. 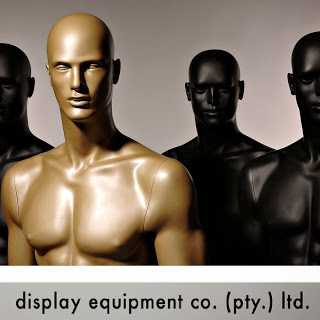 Ever helpful, the Display Equipment Company offers a bronzed prototype with improbable pectorals and three dark and shadowed clones. The winner for shop window diversity at the V and A Waterfront is Woolworths, South Africa’s incarnation of Marks and Spencer. Here, there are elegant clusters of black men and women, wearing clothes that are “perfect for friends and family alike”. There was, perhaps, some quiet satisfaction in Woolworths’ management offices as Tlalane Letlhaku’s finely-honed tweet sliced its way through H & M’s lavish layers of PR. This, though, would not have lasted more than ten days because by mid-month Woolworths was saddled with its own mannequin mishap. I have a problem with the display of black dolls wearing your clothes with a rope on them in your stores. This depicts slavery and such display of this in your shop suggests you promote such barbaric acts against humanity. Please remove this rope on these black dolls with immediate effect. This is insulting us as black customers and anyone who is a victim of slavery. “Hi there. You’ve got a very valid point. We’ve contacted our store installation team and will get back to you as soon as we can”. And later: “we’re so sorry, it was a mistake”. Their social media team should have left it at that. The further explanation that the display had been incorrectly installed and that the six men were meant to be joined together by “Christmas baubles suspended off ropes” lacks credibility – has anyone seen six grown men actually doing this? And this for a further exoneration: the mannequins are made from recycled materials that are “naturally grey in colour”. Consequently, they “don’t represent a particular race”; no offence can be given. Does all this matter? some may think not; there are plenty of other things to get angry and depressed about right now. And to bring up this sort of thing is to invite a raised eyebrow, perhaps a sneer. But there is surely something going on when the marketing departments of high end retail stores – so adroit in winkling our credit cards from our wallets – are so determined to express their values by whitewashing out the diversity of their customers. Shop windows are a mirror to our aspirations, to our imagined future selves. Under challenge, Woolworths offers regimented bodies, clutching Christmas decorations, and recycled to shades of grey; a grey new South Africa.